A year ago I wrote a piece about the big three ratings agencies and how they viewed Ireland and the Irish banks. The piece had a pleasant enough tone about it, perhaps because in March 2010 the ratings agencies still had their beer goggles on and reckoned that the Irish banks were in good enough shape to be “investment grade” material. Even Anglo and Permo, although considered to be the most troubled banks in the country at the time, were still hanging on to BBB status and their (barely) “investment grade” label. Certainly in early 2010 the agencies had been downgrading our banks as revelation after revelation seeped out. They even downgraded the entire banking system one notch, but there was still an air of hope that we could pull through. The suspension of disbelief came to an end in February 2011 when Standard & Poor’s and Moody’s finally announced that they were downgrading the bulk of the Irish banks to junk status. The Fitch rating agency had already bestowed the junk label on the Irish banks the previous December and at the time many pundits wondered what had taken them so long. Last month our own media, certainly weary from ugly bank stories and probably busy getting themselves ready for the election, gave the downgrades some attention, but it was the overseas press that really picked it up and ran with it. Headlines with the words “Ireland”, “banks” and “junk” appeared in huge numbers worldwide. The individual banks haven’t been the only victims of these brutal downgrades though. The Irish banking industry as a whole and Ireland herself have also suffered. The best known rating agency, Standard & Poor’s, operates something it calls the BICRA. It stands for Banking Industry Country Risk Assessment and it assigns countries into groups with numbers ranging from 1 to 10 based on the stability of their banking systems. It’s a bit like a bunch of clubs where you’re grouped with those that share your common interests. With the BICRA, Group 1 contains the countries with the best banking systems and Group 10 contains the dodgiest. Countries at the top of the scale include Switzerland in Group 1 and Japan in Group 2. Countries at the bottom of the scale include Kazakhstan in Group 9 and Ukraine in Group 10. Stating that the “decline in creditworthiness of the Irish banking system over the past three years, and the related collapse in investor confidence, to be one of the most severe that we have observed in a major developed economy...” Standard & Poor’s downgraded our banking system two more levels to Group 6. Our new stable-mates now include Estonia, Cyprus and Turkey. The individual bank ratings are probably the most telling though, and the fall for certain banks has been nothing short of spectacular. AIB and Bank of Ireland both shared an A+ rating from Standard and Poor’s three years ago and it took S&P a couple of years to downgrade them both two notches to A- status. 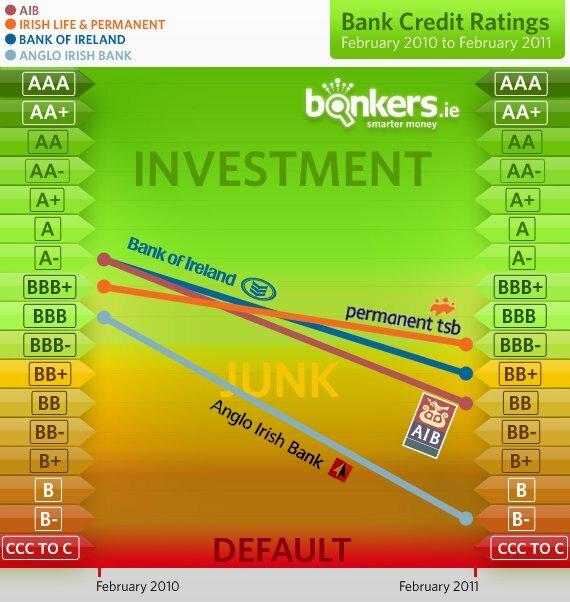 However, over the last year as the state of the finances at banks has become clear, both BOI and AIB were hammered down 4 and 5 ratings to BB+ and BB. These are considered speculative or junk ratings. In the same period, Anglo has gone from an A rating to a B-. That’s a fall of 10 and leaves it one rating away from a C. Anything with a “C” in S&P speak is currently defaulting and not meeting it’s obligations. Which is a nice way of saying that depositors aren't getting their money and loans aren't being paid. The only one of the big four banks covered by the unlimited guarantee scheme not considered junk by S&P is Permanent TSB. But they have a BBB- rating with a negative outlook. That’s about half a point short of the junk pile. As if it couldn’t get any worse, Ireland herself was downgraded again by S&P in February, not to junk, but to an A-. That’s a drop of 4 places in a year. In ratings language it means that Irish sovereign debt is still considered worth a punt, but only just. As a country, the bond markets now want us to pay more than 9.5% interest to borrow money over 10 years. A staggering amount and three times as much as the Germans currently pay to borrow money over the same period... but then they have an AAA rating. Of course all of this points in the same direction. Inability to pay. Default. Call it what you will, but we’re smashed and living on borrowed cash, borrowed time and what little good will we have left. The level of Ireland’s debt is simply staggering, well documented and expected to keep growing - mostly becuase of the bank guarantees. And it is of course unsustainable. The ratings agencies know this and have slammed our banks to junk status. The bond markets know it and are charging us appropriately. Even the Irish people know it and they are voting with their feet. €18.5 bln has been taken out of Irish bank accounts between Febuary ’10 and January ’11. That’s 10% of our total deposits in just one year. So what happens when depositors get really nervous and want all their money now? Well, so far, the cash to pay depositors has come from the Central Bank and the ECB. But if there was a sudden mass move to take money out of Irish banks, say half of what's on deposit now - €80 billion or so? What then? Nobody knows yet, but when it happened in Argentina 10 years ago the government just stopped people from being able to withdraw cash in large amounts. They were were given a cash ration instead. Yes, our new government is trying to negotiate a better deal for Ireland with seemingly intransigent EU officials, but the financial world is expecting our little house of cards to collapse very soon. They’ve put the writing on the wall – it’s in the ratings of our banks, the rating of our banking industry, the rating of Ireland and it’s in the interest rates we're being charged. With everyone betting against us, it looks like it could just a matter of when. Below are the Standard and Poor’s long-term ratings for banks that are trading in Ireland as of February 2011. Not all Irish financial institutions are rated by S&P. For EBS, a Moody's rating has been used.